Every once in a while, I include breakfast for dinner in my weekly meal plans. My husband and I make green juice for breakfast during the work week and we rarely branch away from oats or cereal on the weekends (except when we explore a new restaurant for brunch in Seattle), so having breakfast for dinner is a great way for us to enjoy eggs, bacon and other delicious breakfast foods. 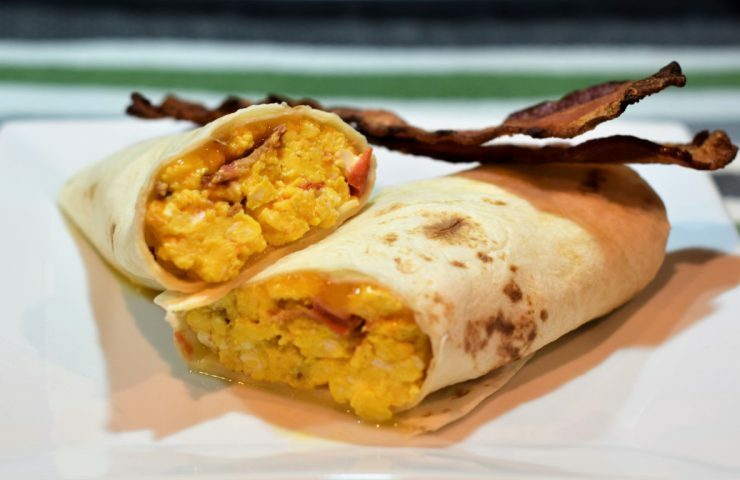 This burrito recipe is a take on my dad’s signature breakfast, but instead of adding hash browns to the skillet, the eggs and bacon are rolled up into a tortilla shell and eaten as a burrito. This recipe is also easy to make and allows you to get a weeknight dinner or weekend brunch on the table in a short amount of time. 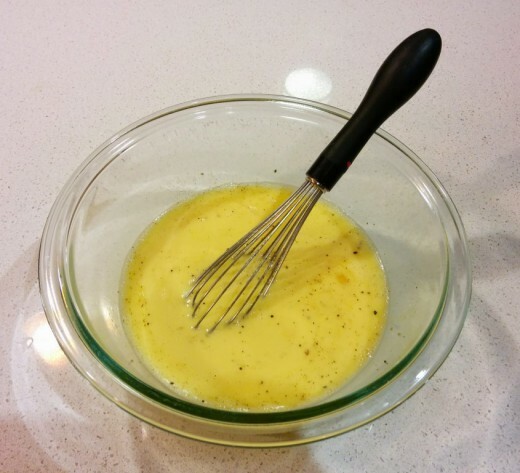 In a small bowl, whisk eggs together and season with salt and pepper. 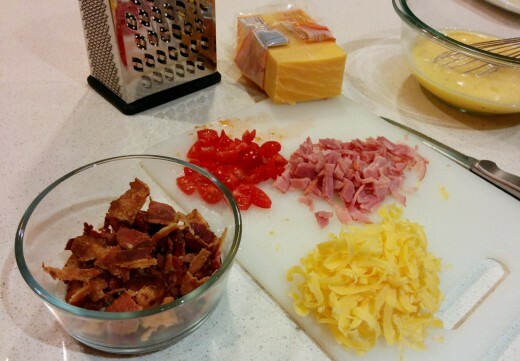 Have your diced ham, sliced tomatoes, crumbled bacon, and shredded cheese ready to go. Heat a skillet over medium heat and coat the pan with non-stick spray or olive oil. Add diced ham and sliced tomatoes to the skillet. Cook for 2 to 3 minutes, until the tomatoes begin to soften and the ham browns slightly. Slowly pour in eggs over the tomatoes and ham. Gently stir the eggs as they begin to set. When they are just about done cooking, add in 1/4 cup cheese. Stir to combine, and allow the cheese to melt and the eggs to finish cooking. 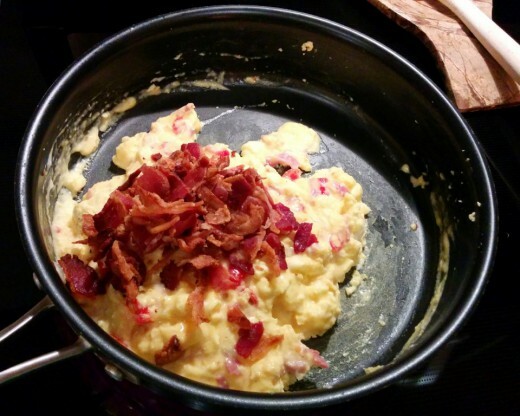 Mix in the crumbled bacon and allow it to heat up. To assemble the burritos, divide up the remaining cheese and sprinkle onto each tortillas. 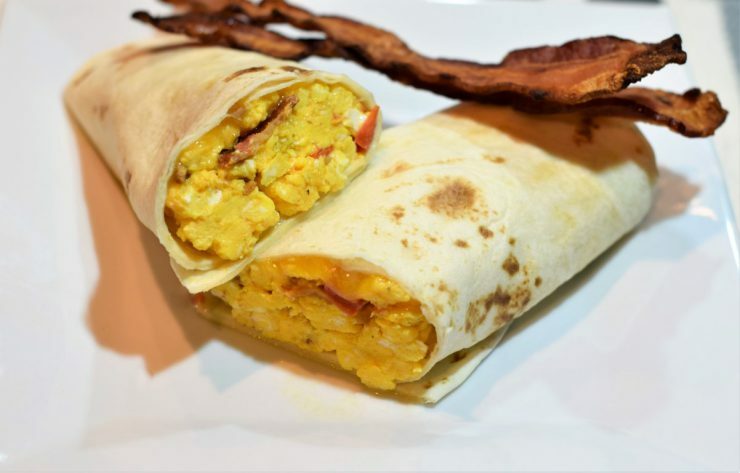 Spoon the egg mixture on top and roll up the tortilla like a burrito. If you like salsa with your eggs, add a little salsa to the burrito or use it as a dip on the side. In a small bowl, whisk eggs and season with salt and pepper. Heat a skillet over medium heat and coat with non-stick spray or a little olive oil. Add diced ham and tomatoes. Cook for 2-3 minutes, until tomatoes soften and ham browns slightly. 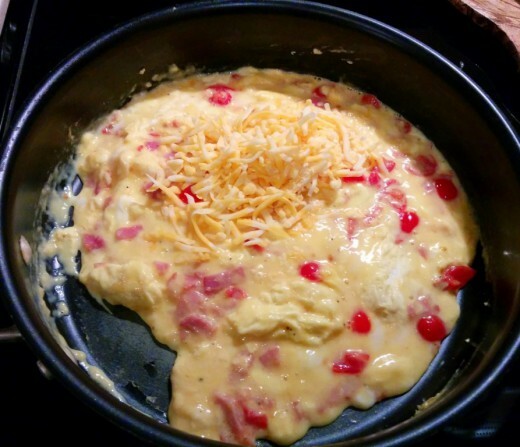 Slowly pour in eggs over tomatoes and ham. Gently stir as the eggs begin to cook. When they are almost fully cooked, add in 1/4 cup of the cheese. Combine and let melt as the eggs finish cooking. To assemble the burritos, divide up the remainder of the cheese and sprinkle on top of the tortillas. 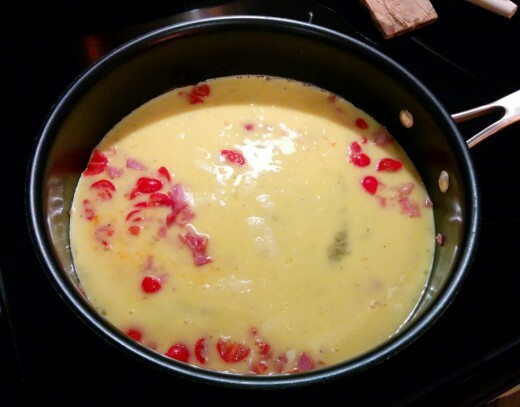 Divide up the egg mixture and spoon on top of the cheese. Roll up the tortillas into a burrito and enjoy with salsa if you desire!